Note: the above is NOT a point of sale for Blue Owl products, but an agricultural area. Janell is happy to give tours of the herb farm and/or the tree farm, but please contact her, as above, to arrange a time. If you would like the hear more about Blue Owl product updates or offerings as they develop, please drop me a line by emailing boge@blueowlgarden.com and ask to be put on our mailing list. I am also happy to do special orders outside the regular market season, so if you have a hankering for something, contact me and I'll let you know if it is currently available. Free weekday deliveries to Granville, OH are possible throughout most of the year. 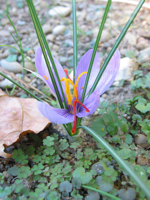 Saffron does grow in Ohio!